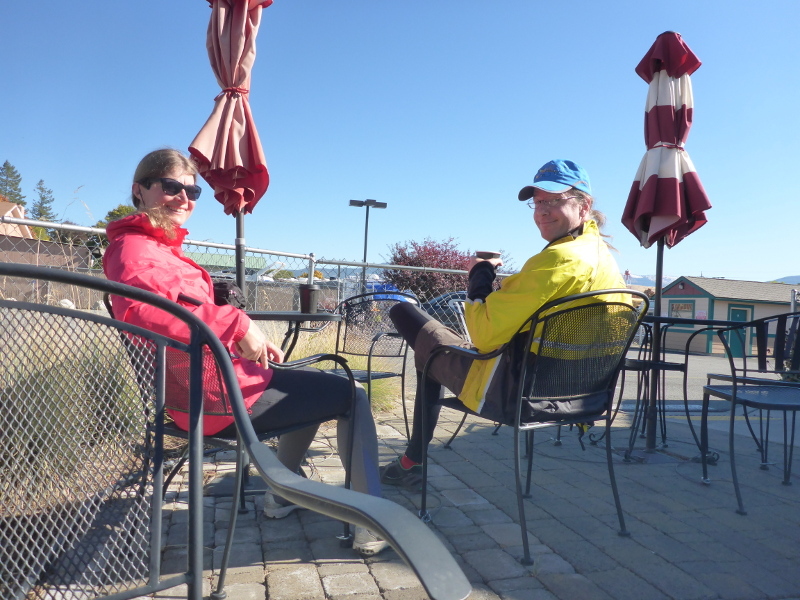 A week or two ago, I came across a blog post with a “Coffeeneuring” challenge. 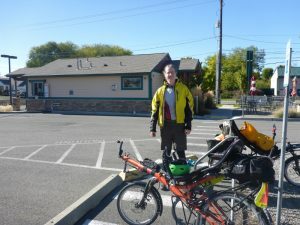 Zach and I thought it would be fun, so yesterday we did our first coffeeneuring ride. What, you may ask, is coffeeneuring? To understand that, you need to know about “randonneuring”, which is the formalized sport of self-supported long-distance endurance cycing. Randonneurs participate in rides of 100km and up, with set routes, rules, time limits, and a set of checkpoints, and then turn in evidence of their rides to get credit for having done them. The randonneurs I have met are very passionate about their sport, and enjoy traveling to new places to do rides, and keeping track of how much they have ridden each year. Randonneuring is not really our style… We definitely enjoy long-distance cycle touring, but we’re not very concerned about how many miles we do per day, don’t want a time limit, and like to be free to stop and see things along the way when we tour. So, coffeeneuring — it’s kind of a parody of randonneuring, as it has a set of (tongue-in-cheek) rules (see link above). Basically the idea is to take 7 bike rides to get coffee (or some other hot beverage), each of at least 2 miles round trip, no more than 1 per day or 2 per week (the week starts on Friday), between October 13 and November 19. Like randonneuring, you have to document that you’ve done the rides (although how to document it is kind of up to you — we’re using our blog). Hopefully we’ll complete the whole series before it gets too icy! 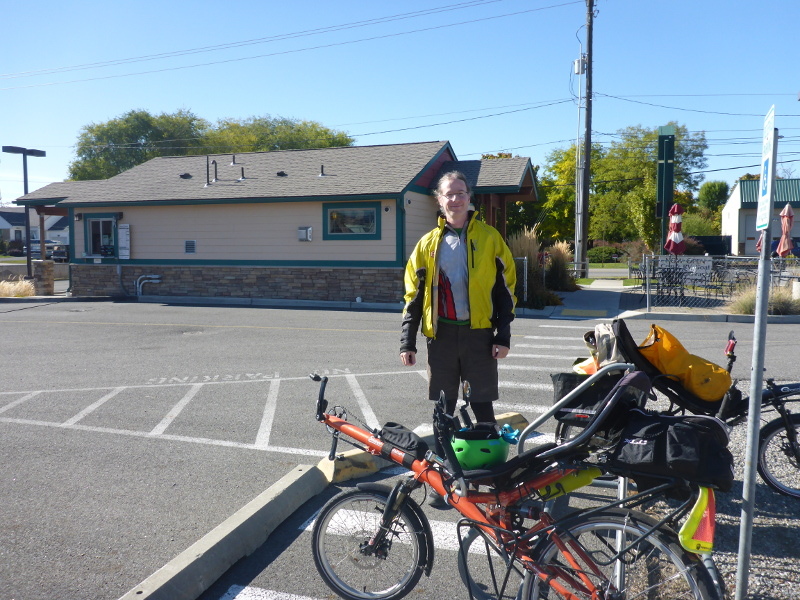 Anyway, after that long explanation… Yesterday, we set off around noon on our first coffeeneuring ride! We rode from our house to the Cozy Coffee & Bistro at 514 N Barker road (about 5 miles away via the Centennial Trail), then to a grocery store in Liberty Lake, (you’re allowed to do other errands on your ride), and then home — a total of 11.1 miles. It was quite a nice day, and we enjoyed the ride… We took a photo or two, and recorded a GPS trace of the ride. 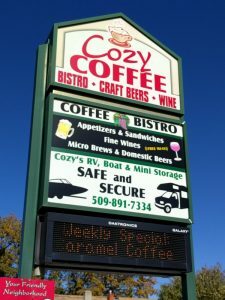 We stopped at the Cozy Coffee this time. Cozy Coffee has a bike rack! We sipped hot chocolate at the outside tables. Beautiful day! If anyone in the Post Falls to Spokane Valley area wants to coffeeneur with us in the next few weeks, get in touch!